The data for the graph is approximate and not all from the same year, but it’s not an order of magnitude out. I’ve split the force into 3 shifts and said that at any one time 1 in 4 of that shift are out of action (office work, taking suspects to the station, etc). I picked the EU5 countries, plus other English-speaking locations as comparisons. For the capital city, perhaps there are relatively more police, but my assumption would be that this would scale across countries. (Actually, the numbers for Haringey, a borough of London, come out to be the same for England and Wales). 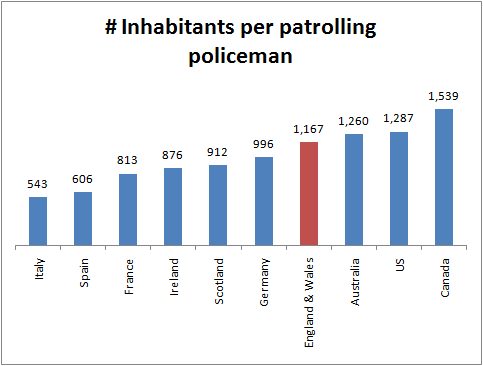 Overall therefore, the policing levels in London are not wildly different from other parts of the world, though perhaps on the low side. So if 0.2% ish of the population across multiple extended geographic areas get upset and starts building wigwams, that could be hard to deal with immediately. Taking 10% of a population to be male youth, it’s not hard to imagine areas where more than 1 in 50 kids are gang members – which gets us comfortably to 0.2% of the population.